Copyright: Lawrence J. Fleenor, Jr.
Yellow Creek runs throughout American History, and its implications for Southwest Virginia and East Tennessee are tremendous. The course that the stream cuts through our past is intriguing and far reaching. The Indian Confederacy that lived in the Hudson and Mohawk River Valleys is referred to in the English tradition as the “Iroquois”, but the first European settlers of that region were the Dutch, and they referred to these Indians as the “Mingo” (a competing scholarly tradition holds that the Mingo are the remnants of the Erie, who were mostly wiped out by the Iroquois). This Confederacy consisted initially of five separate tribes, the Mohawk, the Oneida, the Onondaga, the Cayuga, and the Seneca, and later were joined by their cousins from North Carolina, the Tuscaroras. They held suzerainty over other great tribes, such as the Delaware and the Shawnee. For reasons that are lost to history, in the 1750’s fragments of several of the separate tribes of the Iroquois and of the tribes dominated by them came to live together as a “tribe” or as a confederacy in the Ohio Valley. The earliest references to them call them “the Ohio Seneca”. George Washington’s 1753-54 map of the Ohio country shows “Mingo Town” as being on the Ohio River about 20 miles below Pittsburgh. Later they lived among the Shawnee on the Scioto River in Ohio, and later still in modern Mingo and Logan Counties, West Virginia, in the area of Williamson. John James Logan is the best known leader of the Mingoes. Born in 1725 and named Tah-Gah-Jute, his mother was a Cayuga and his father, Shikellamy, was a French Canadian who had been captured as a child by the Oneida and had been raised as one of them, and later became a chief of that tribe. The Iroquois sent Shikellamy to their subservient tribe, the Delaware, as their representative. In that capacity he made the friendship of the Secretary of the Colony of Pennsylvania, James Logan, and named his son after him. After the tribal displacements of the French and Indian War John Logan moved to Ohio and married a Shawnee, and the early 1770’s found them living in Western Pennsylvania just to the east of Wheeling. Hermann Groethausen was born in Germany, and immigrated to Pennsylvania. His son was Harman Greathouse, settled in Holiday’s Cove in current West Virginia. One night his cabin was attacked by a party of Indians, who tried to pry open the door while Herman was shooting at them out the cabin’s portholes. Mrs. Greathouse and a Mrs. Muncy made a great commotion inside the cabin, and called out imaginary men’s names, urging them to arm themselves with powder and ball. Then the intrepid Mrs. Greathouse fired a rifle from the upstairs window, and the Indians, convinced that the house was filled with armed men, left. Herman had a son named Daniel, and who lived on his 400 acres in 1771 at Mingo Bottom in Ohio County, Virginia (now West Virginia). Yellow Creek flows into the Ohio some forty miles above Wheeling. A Mr. Baker operated a tavern at the mouth of Yellow Creek, and sold alcohol to both Whites and to Indians. Tensions were already heightened due to several murders back and forth among the settlers and the Indians. Who had drawn first blood is long forgotten. Word was sent out from Fort Pitt for the settlers to congregate at the fort, as war seemed likely. Baker was preparing to evacuate when a squaw came across the river and told him that the Indians were preparing to murder him and his family. Baker called for help, and Daniel Greathouse and 21 other men responded, and on April 30, 1774 they concealed themselves in Baker’s back room. Soon nine (some records say seven) Indians, including almost all of Logan’s kin, crossed the river and came into Baker’s Tavern. Among them were Logan’s brother, and two women and a child. The Indians drank heavily, and Logan’s brother put on a coat and hat belonging to one of the white men, and was promptly shot. The concealed Greathouse party then rushed out of the back room, and killed all the Indians except for the child. They then rushed out of the house and saw two canoes filled with armed war painted Indians crossing the River toward the tavern. The whites fired on the Indians, killing most of the occupants of one of the canoes, and driving the second back across the river. Greathouse scalped the Indians, and tied the trophies to his belt. Weeks before the Yellow Creek massacre, some Cherokee had stolen a settler’s horses, and had killed two of the whites. On April 16th the Cherokee killed some employees of the trader Butler. Emotions on the frontier became superheated. A Captain of Rangers, Michael Cresap, was near Wheeling at the time, and recruited some backwoodsmen and declared war on all Indians. They planted a war post, and did a war dance around it. On the 27th, Cresap, and his militia company murdered some peaceful Indians that likely included friends and relatives of Logan. The next day Cresap and his men attacked a party of Shawnee who had come to trade at Fort Pitt, and killed one of them and wounded two others. At the time, Cresap publicly boasted of the murders. What really were three separate massacres became quickly fused in people’s minds as a single event. This “Yellow Creek Massacre” was the immediate cause of Lord Dunmore’s War of later in 1774. Tensions were already high because the Iroquois had negotiated the Treaty of Fort Stanwix, in which they ceded their lands in the Ohio Valley south of the river to the British. While the Iroquois themselves did not live there, their subservient tribes, the Shawnee and the Mingoes, did. After Yellow Creek, the Shawnee and the Mingoes went on the war path, and Logan went berserk. Lord Dunmore was the Royal Governor of Virginia, and led a two pronged attack against the Shawnee. One column Dunmore, himself, led down the Ohio River from Fort Pitt, while another consisting of frontiersmen from Southwest Virginia, collided on October 10th with the Indians at Point Pleasant, where the Great Kanawha River meets the Ohio. A terrible day long pitched battle occurred, and at the end the Shawnee withdrew from the field and returned to Ohio. It had been a near thing. This “Battle of Point Pleasant” is often referred to as the only conflict of the war. This was not so. The entire frontier from Pennsylvania to Tennessee had been involved in raids and killings. The Indian strategy had been for the Shawnee under Chief Cornstalk to march up the Kanawha / New River into Virginia, and to drive the settlers out. Being a much smaller tribe, the Mingo had been assigned the task of harassing the settlements in Southwest Virginia and East Tennessee in order to draw off militiamen from their campaign to attack the Shawnee. Logan, admittedly lusting for blood after the Yellow Creek Massacre, led his warriors into the Valleys of the Clinch and Holston. On September 8th Logan and his Mingo attacked the North Fork of the Holston and assaulted Samuel Lammey, John and Archibald Buchanan, and John Henry. The settlements on the Main Fork of the Holston evacuated to Royal Oak at Marion. On September the 13th Mingoes attacked a militiaman near Maiden Spring Fort in Tazewell County. 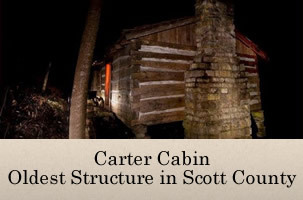 On the 23rd Logan and his warriors attacked Fort Blackmore in Scott County. They then went on the 24th to King’s Mill (Kingsport) and killed the John Roberts family, except for a boy whom they took captive. Then on the 29th Logan went to Moore’s Fort in Castlewood where Daniel Boone was in command, where John Duncan was killed. On October 9th they simultaneously again attacked Fort Blackmore and the Fort at Sapling Grove (Bristol Tennessee). Logan was pursued back into West Virginia by way of the Breaks of the Big Sandy by a party of militiamen led by a man named McClure, all to no avail. Logan personally took thirty scalps during the war. This message was carried by the war party on their foray into the Holston Valley, and was left by the bodies of the Roberts family at King’s Mill. Logan seemed to not know of the role that Greathouse had played in the massacres, and he came to blame Cresap alone for them. Even though the settlers had won Lord Dunmore’s War, it remained a bitter experience for many. Due to Logan’s pronouncements, which were widely printed in newspapers up and down the colonies, Cresap was the recipient of much hatred by the whites. George Rogers Clark, who was soon to become famous as the conqueror of the Old Northwest Territory, was a member of the Cresap company, and knew the truth about the recent massacres and of Cresap’s role in them. As the militiamen were discussing Logan’s speech around the campfire, Clark turned to Cresap and jeered and rallied against him. Cresap was much angered, and swore that he had a good mind to tomahawk Greathouse. Cresap hated Greathouse as long as he lived, and history has largely exculpated him of his role in the massacres. After the peace conference had ended, Patrick Porter, a militiaman from present Dungannon, Scott County, Virginia, was preparing to return home when Logan approached him. Logan asked Porter to take a Mingo orphan boy, whose parents had been killed by whites, home with him. Porter at first refused, fearful that the Mingoes would follow and kill him. But Logan said that he would tell the Indians that the boy had drowned. Logan said further, “I want you to take Dale, the lonely Mingo boy, because he wants to go with you, Patrick. It is strange. It is strange indeed that he wants to go with you. But he says he wants to learn to read and write. He says you can teach him. He wants to become a missionary among the whites. Porter replied again, “I am afraid your tribesmen will come to the Clinch and kill my family.” “Mr. Porter”, Chief Logan said, many a time I was on the Clinch River. Many a time I could have killed you. But I did not. I did not because I heard you were a good man. You are good to your children, I’ve heard. That makes me love you. I know you will be good to Dale. I was near your fort on the Clinch once and I was about to steal your horse. It was just after night fall. I put a small shock of fodder over me and I moved toward your fort. Then I heard a child scream and I thought I was detected. I threw down the fodder and ran. Mr. Porter, did you see that fodder shock?” ‘Yes,” said Mr. Porter, “I saw it. I was on guard at the fort gate that night. I saw the fodder moving and I knew an Indian was in it. I pointed my gun and cocked the hammer. Then a child fell out of bed. When it screamed the fodder dropped. I saw a man run. I went into the house. The child had broken its arm. And that saved you, Logan. I had as good a bead on you with as good a gun that was ever fired.” Logan grunted and said, “the Great Spirit will not let one friend kill another.” Patrick Porter took the Mingo boy, Dale, home with him to the Clinch. He gave him the first name “Arter”. Arter Dale learned to read and to write, using the Bible as his text. He married a white woman and moved to the Hurricane section of Wise County, where he is buried, and where many of his descendents live today. Lord Dunmore’s War proved to be only the opening phase of the Revolutionary War. The British continued to follow a policy of limiting western expansion of the colonies, while guaranteeing the Indians peace in their homes. Lord Dunmore’s War, like the earlier French and Indian War, only strengthened the British in their resolve to keep the peace at the price of stifling the western expansion by the colonial settlers. At the very time that the War was being fought, affairs in Boston were reaching an obvious point of political explosion. The militia on its return from the Battle of Point Pleasant was acutely aware of these events. When the militia reached the mouth of the River Hockhocking, the officers held a meeting. They wrote a statement for publication stating that while they had followed the English Earl into battle, they were in fact in sympathy with the Continental Congress, then in session at Philadelphia. They expressed devotion to the King, but only as a free people, and remarked that they could fight as well as any army in the world. Lord Dunmore returned to Virginia to public acclaim, but within months of his return he was forced to flee to England in the opening strife of the Revolution. The beating that the Shawnee received at Point Pleasant kept them peaceful during the first two years of the Revolution. It was during this hiatus that settlements in Kentucky gained a foothold, one which proved strong enough that when the Shawnee did regain their courage their attacks on the settlements in the Blue Grass proved to be ineffective. George Rogers Clark left Cresap’s command and moved to Kentucky, where he captured the Old Northwest Territory, or the lands between the Mississippi River and the Ohio River. None of this would have been possible if the Indians had not lost the Battle of Point Pleasant, and that battle was the result of the massacre at Yellow Creek. It is quite likely that without Lord Dunmore’s War the United States of America would have found its western boundary to have been located along the Alleghany Mountains, with Kentucky and the Old Northwest Territory having remained British Indian Territory. Thomas Jefferson published Logan’s speech in his “Notes on Virginia”, and was very critical of Cresap. Twenty three years after these events had occurred, the Yellow Creek massacre and Jefferson’s criticism of Cresap found themselves to be at the center of American national politics. Jefferson, the founder of the Democratic Party, found himself locked in an acrimonious conflict with the Federalists. One Luther Martin, a Federalist, and who just happened to have been Cresap’s son-in-law, bitterly attacked Jefferson in public print for ‘wrongly’ defaming the reputation of Cresap. This theme was picked up by a Mr. Jacobs, who wrote a biography of Cresap and did his best to denigrate Jefferson. The process would not die, and Neville B. Craig published an article in the historical magazine, “The Olden Times”, rehashing the issues. And, even later, Brantz Mayer published a book Logan and Cresap. By this time the nation was heading towards Civil War. Logan became a sullen alcoholic, and in 1780 he knocked his wife unconscious. Thinking that he had killed her, he fled, and was pursued by a party of Indians. He was cornered and killed by his nephew. Michael Cresap returned to Maryland, and even though ill, he raised a company of militiamen who rushed to the defense of Boston, where Cresap died in 1775. That year also claimed the life of Daniel Greathouse, who died of measles at the age of 19. Addington, Robert M. – The History of Scott County, Va.